Standing over 5 feet tall, this impressive figure has an almost realistic presence. This project is cut primarily from standard "1x12" and "2x12" stock. Layered design simplifies painting and creates a 3-dimensional look. All patterns drawn FULL SIZE. Lantern can be lit by adding a wiring harness and frosted flame tip bulb. Order hardware parts package separately or see Special Offer below. 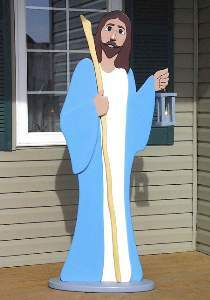 62" Jesus Hardware Parts Package Contains lamp socket with 6 ft. wiring harness and on-off switch, frosted flame tip bulb, brown plastic eyes and screw eyes. Project plan, wood and paint are not included.